At long last, our (technically) first album, “Suburban Nostalgia“, all remixed and polished, is now available to listen to and buy on iTunes and CDBaby. Wow, TWO albums officially released. Fantastic! 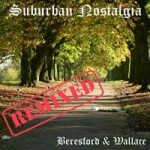 After what seems like ages (well at least 11 months), the brand new and very shiny “Suburban Nostalgia Remixed” album is ready and waiting for your ear’oles! After the process or writing and recording “Weird and Wonderful”, we felt that the first album seemed a little rushed and unpolished by comparison, so we set about changing some keys, refining the guitar work and laying down new live drum and vocal tracks. We think the finished version is a cut above our original effort, and to that end, we are no longer offering the original album for either sale or streaming…. This new album will be added to our iTunes and CDBaby store in due course, but in the meantime you can listen to the whole album from our new Music Player. Well… “what’s next” is the remixing of our first album “Suburban Nostalgia“! During the recording of “Weird and Wonderful“, we refined our recording process and as a result, we’d like to go back and give our first work the same treatment! For Annie, this means substituting drum loops and synth bass lines for the real thing…. as well as structuring the tracks a little better. Next, we’ll be redoing quite a few vocal performances as well. Next is, actually, some LIVE appearances as part of the Chorlton Players’ annual comedy and music shows, this year entitled “Pimp My Hotpot“. We will be doing a 20 minute set as a kind of “half-time show”…like the Superbowl! Yes, we will be singing live, and we will also have a guest musician with us, so if you fancy it, why not come along to see us at the show. It runs from Thursday the 3rd of June to Saturday the 5th of June. Tickets are £7 Adults, £5 Concessions. We’re part of the Facebook ‘Storm the Charts’ campaign, which ISN’T about another old song by a famous artist, or about getting a song to number one. They have collected more than 400 submissions of songs from bands and musicians who are on independent labels or completely unsigned (with more still to process). As a group they’re going to pick 40, and then see *how many* we can get in the official top 40 all in the same week. They’ll call a ‘success’ finding some good new music; a ‘win’ getting 2 or more songs in the charts, and anything above that is epic – the more the better. Join the group, get listening and help choose the 40 songs! They need well over a million people in the group if we want to take every single chart slot, so for heaven’s sake invite your friends.